El Lórax (The Lorax Spanish Edition) (Classic Seuss) (Hardcover) | River Dog Book Co.
¡Edición en español y rimada del famoso clásico de Dr. Seuss sobre la protección del medio ambiente! Mucho antes del triunfo de la corriente «ser verdes», Dr. Seuss habló en nombre de los árboles y nos advirtió del peligro de no ser respetuosos con el medio ambiente. En esta excelente traducción rimada (impresa en papel reciclado), conocemos a Fuena-Vez y cómo la tala de los áboles Trúfula cambió para siempre el paisaje. Regalo ideal para los pequeños guardianes ecologistas y admiradores de Dr. Seuss, El Lórax no solo nos muestra la belleza del mundo que nos rodea, sino que también nos enseña que es responsabilidad nuestra protegerlo. (El Gato Ensombrerado ha regresado); I Can Read With My Eyes Shut! (¡Yo puedo leer con los ojos cerrados! ); Horton Hears a Who! (¡Horton escucha a Quién! ); And to Think That I Saw It on Mulberry Street (Y pensar que lo vi por la calle Porvenir); The 500 Hats of Bartholomew Cubbins (Los 500 sombreros de Bartolomé Cubbins); There's A Wocket in my Pocket! (¡Hay un Molillo en mi Bolsillo! ); Mr. Brown Can Moo! Can You? (¡El Sr. Brown hace Muuu! ¿Podrías hacerlo tú? ); Ten Apples on Top! (¡Diez manzanas en la cabeza! ); What Pet Should I Get? (¿Cómo podré decidir qué mascota elegir? ); y Yertle the Turtle and Other Stories (Yoruga la Tortuga y otros cuentos). Además, se publicarán nuevas ediciones en español ¡todos los años! A rhymed, Spanish translation of Dr. Seuss's beloved classic about protecting the environment! 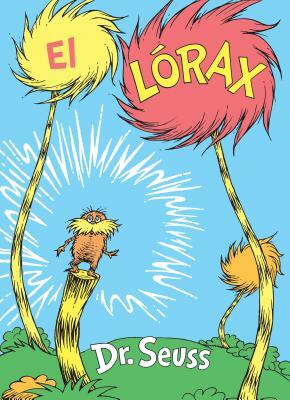 Long before "going green" was mainstream, Dr. Seuss's Lorax spoke for the trees and warned of the dangers of disrespecting the environment. In this excellent, rhymed translation (printed on recycled paper), we learn of the Once-ler and how his harvesting of the tufted Truffala Trees changed the landscape forever. A perfect gift for young Dr. Seuss fans and budding environmentalists, The Lorax shows not only the importance of seeing the beauty in the world around us, but also our responsibility to protect it. THEODOR SEUSS GEISEL—aka Dr. Seuss—is one of the most beloved children's book authors of all time. From The Cat in the Hat to Oh, the Places You'll Go!, his iconic characters, stories, and art style have been a lasting influence on generations of children and adults. The books he wrote and illustrated under the name Dr. Seuss (and others that he wrote but did not illustrate, including some under the pseudonyms Theo. LeSieg and Rosetta Stone) have been translated into thirty languages. Hundreds of millions of copies have found their way into homes and hearts around the world. Dr. Seuss's long list of awards includes Caldecott Honors for McElligot's Pool, If I Ran the Zoo, and Bartholomew and the Oobleck, the Pulitzer Prize, and eight honorary doctorates. Works based on his original stories have won three Oscars, three Emmys, three Grammys, and a Peabody. To learn more about Dr. Seuss's life and books--and for fun games and activities—visit Seussville.com!